If you are an Israeli synagogue-goer whose rabbi recognizes the Jewish state (Satmar Hasidim and Netorai Karta can stop reading here), I urge you to speak urgently to your rabbi about our government’s involvement in what is surely a massive violation of Torah law with its planned deportation of 37,000 African asylum seekers. In the world of international politics, the fate of these 37,000 souls, mostly from Eritrea and Sudan, who entered Israel illegally before the completion of its highly effective security fence on the Egyptian border, hangs on their legal status. Are they seeking asylum from persecution, in which case they deserve refugee status and can stay, or are they economic migrants, in which case they must leave? Almost inevitably, the discussion turns to immigration policy: who is, and who is not, entitled to seek refuge in the state of Israel? But this is a Jewish state, and we have our own legal definition for these men, women and children. They are ‘gerim’, and our obligation towards them is set out in the clearest possible terms – twice – in this week’s reading from the Torah, parashat Mishpatim. Exodus 22:21 You shall not wrong or oppress the ‘ger’, for you were ‘gerim’ in the land of Egypt. 22 You shall not abuse any widow or orphan. 23 If you do abuse them [literally ‘him], when they cry out to me, I will surely heed their cry; 24 my wrath will burn, and I will kill you with the sword, and your wives shall become widows and your children orphans. Exodus 23:9 You shall not oppress the ‘ger’; you know the soul of the ‘ger’, for you were ‘gerim’ in the land of Egypt. 10 For six years you shall sow your land and gather in its yield; 11 but the seventh year you shall let it rest and lie fallow, so that the poor of your people may eat; and what they leave the wild animals may eat. You shall do the same with your vineyard, and with your olive orchard. 12 Six days you shall do your work, but on the seventh day you shall rest, so that your ox and your donkey may have relief, and your homeborn slave and the ‘ger’ may be refreshed. There’s a lot of confusion about how to translate the term ‘ger’. Many translators opt for ‘stranger’, which has much to recommend it. But I follow Rashi, commenting on Exodus 22:20 above: ‘Every expression of “ger” means a person who was not born in that country, but came from another country to sojourn [‘la’gur’ – from the same Hebrew root as ‘ger’] there’. In today’s terminology, the ‘ger’ is a ‘resident alien’ – a person living in a country for an extended period, without the intention of becoming a citizen, and lacking the protection of full citizenship rights. As here in Exodus, the Torah often links the ‘ger’ with two or three other groups who may lack protection and therefore require special support from society: the widow, the orphan and the poor. But in one crucial respect, the ‘ger’ is different from all these. Widows, orphans and the poor are found wherever there are human beings, but the ‘ger’ can exist only in a Jewish national context. Diaspora Jews can aspire to qualities and attitudes – such as compassion and empathy (see Rabbi Jonathan Sacks here) – that are consistent with proper treatment of the ‘ger’. But only in a Jewish national entity, the state of Israel, can the commandments can be kept literally. This point was brought home to me by an article by an American rabbi just published in Commentary Magazine. In ‘Judaism Beyond Slogans’, Jeffrey K. Salkin identifies four ‘slogans’ which, in his opinion, are used in empty and meaningless ways by left-leaning American Jews. Rabbi Salkin is correct that it’s difficult to fulfil the mitzvah of loving the stranger if you live in America. But in Israel, a Jewish polity, it’s a completely straightforward obligation, as you can hear (in Hebrew) in this powerful video. We are repeatedly and explicitly prohibited from abusing or oppressing the resident alien who lives among us, and the Torah offers plenty of guidance about what this would entail. First, the Torah creates a strong association between the prohibition against abusing and oppressing resident aliens and our own negative experience as resident aliens in Egypt. This form of guidance is emotional and intuitive. You know the soul of the ‘ger’ (Exodus 23:9), what it’s like to be a resident alien. Would you welcome this treatment for yourself or your children? Genesis 12:10 Now there was a famine in the land. So Abram went down to Egypt to reside as an alien [la’gur] there, for the famine was severe in the land. 11 When he was about to enter Egypt, he said to his wife Sarai, “I know well that you are a woman beautiful in appearance; 12 and when the Egyptians see you, they will say, ‘This is his wife’; then they will kill me, but they will let you live. 13 Say you are my sister, so that it may go well with me because of you, and that my soul may be spared on your account.” 14 When Abram entered Egypt the Egyptians saw that the woman was very beautiful. 15 When the officials of Pharaoh saw her, they praised her to Pharaoh. And the woman was taken into Pharaoh’s house. 16 And for her sake he dealt well with Abram; and he had sheep, oxen, male donkeys, male and female slaves, female donkeys, and camels. 17 But the Lord afflicted Pharaoh and his house with great plagues because of Sarai, Abram’s wife. 18 So Pharaoh called Abram, and said, “What is this you have done to me? Why did you not tell me that she was your wife? 19 Why did you say, ‘She is my sister,’ so that I took her for my wife? Now then, here is your wife, take her, and be gone.” 20 And Pharaoh gave his men orders concerning him; and they set him on the way, with his wife and all that he had. Abram entered Egypt to sojourn (‘la’gur’) as a resident alien. He did not intend to stay; he’d just been promised the land of Canaan as an eternal possession for his descendants. He went to Egypt for economic reasons: there was a famine in the land of Canaan, and he needed food. We learn from this that the term ‘ger’ is more expansive than the present-day ‘refugee’. We don’t need to ask whether the ‘ger’ has entered our country because of persecution or because of poverty. Dire need is enough. We also learn from Abram’s sojourn in Egypt that fear, suspicion and ignorance are dangerous causes of conflict between resident aliens and the citizens of the host country. Abram was afraid that the Egyptians would kill him to gain access to his beautiful wife. Pharaoh’s response to his discovery that Sarai was a married woman suggests that Abram was wrong about this. But in any case, Abram’s decision to pass Sarai off as his sister had precisely the consequence he feared. Thinking Sarai was unmarried and available, Pharaoh took her for a wife. God was forced to intervene, and afflicted Pharaoh with plagues on Sarai’s account. Pharaoh responded by driving Abram and Sarai out of the country. Fortunately, they had accumulated wealth in the meantime and had somewhere to go, but forced expulsion is nevertheless among the wrongs we must avoid when dealing with the ‘ger’ in our own land. Exodus 1:1 These are the names of the sons of Israel who came to Egypt with Jacob, each with his household: 2 Reuben, Simeon, Levi, and Judah, 3 Issachar, Zebulun, and Benjamin, 4 Dan and Naphtali, Gad and Asher. 5 The total number of souls born to Jacob was seventy. Joseph was already in Egypt. 6 Then Joseph died, and all his brothers, and that whole generation. 7 But the Israelites were fruitful and prolific; they multiplied and grew exceedingly strong, so that the land was filled with them. Now a new king arose over Egypt, who did not know Joseph. 9 He said to his people, “Look, the Israelite people are more numerous and more powerful than we. 10 Come, let us deal shrewdly with them, or they will increase and, in the event of war, join our enemies and fight against us and escape from the land.” 11 Therefore they set taskmasters over them to oppress them with forced labor. They built supply cities, Pithom and Rameses, for Pharaoh. 12 But the more they were oppressed, the more they multiplied and spread, so that the Egyptians came to dread the Israelites. 13 The Egyptians became ruthless in imposing tasks on the Israelites, 14 and made their lives bitter with hard service in mortar and brick and in every kind of field labor. They were ruthless in all the tasks that they imposed on them. Once again, fear and suspicion feature prominently. The new Pharaoh had forgotten Joseph. He was afraid that the Israelites – who, like Abram, went down to dwell temporarily [la’gur] in Egypt because of famine in the land of Canaan (Genesis 47:4) – will side with Egypt’s enemies in the event of an invasion. He tried to address this fear by limiting their freedom – enlisting them as forced laborers and making their working conditions gratuitously harsh. But the more they were oppressed, the more the Israelites multiplied and spread out. We must avoid Pharaoh’s mistakes, even if only because – setting aside the ethical dimension – he demonstrated the ineffectiveness of oppression as a strategy of control. What threat do the 37,000 African asylum seekers pose to us? I am not alone in believing that they pose no direct threat at all. A lot of misinformation circulates about crime rates in South Tel Aviv, but without doubt the government has committed a serious act of negligence towards its own – mostly poor and disadvantaged – citizens by allowing the asylum seekers to concentrate there and prohibiting them from seeking legal employment. They should be given jobs around the country, where there is plenty of demand for precisely the labor they seek. Indeed, the government is at this moment negotiating to import Chinese workers for the jobs that Israelis don’t want to do. The asylum seekers should be permitted to live in peace, to send money home to their families, and to leave when they want to. Yet although the asylum seekers pose us no threat in my view, we do pose a threat to ourselves when it comes to the asylum seekers. These 37,000 souls – souls just like the descendants of Jacob (Exodus 1:5) who went down to Egypt in search of food; just like Abram, whose fear for his own soul (Genesis 12:13), that is, his bare survival, was so great that he jeopardized the honor and safety of his beloved wife – came to our country as resident aliens, to dwell temporarily (‘la’gur’) here. They are ‘gerim’, resident aliens in our national homeland, and we have an absolute obligation not to abuse or oppress them, even – this is no empty slogan here in the Jewish state – to love them (Leviticus 19:3). The respect in which we are a threat to ourselves regarding the asylum seekers is crystal clear. Our government is poised to compound the abuse and oppression it has already imposed upon them, in clear violation of Torah law in the Jewish state. According to our prophets, this is precisely how we came to be exiled from our homeland during the Babylonian exile. Zechariah 7:8 The word of the Lord came to Zechariah, saying: 9 Thus says the Lord of hosts: Render true judgments, show kindness and mercy to one another; 10 do not oppress the widow, the orphan, the stranger, or the poor; and do not devise evil in your hearts against one another. 11 But they refused to listen, and turned a stubborn shoulder, and stopped their ears in order not to hear. 12 They made their hearts adamant in order not to hear the law and the words that the Lord of hosts had sent by his spirit through the former prophets. Therefore great anger came from the Lord of hosts. 13 Just as, when I called, they would not hear, so, when they called, I would not hear, says the Lord of hosts, 14 and I scattered them with a whirlwind among all the nations that they had not known. Thus the land they left was desolate, so that no one went to and fro, and a pleasant land was made desolate. We lost our land precisely because we abused widows, orphans, the poor and the ‘ger’. It’s for this reason that the fate of the asylum seekers is a matter for urgent discussion with your rabbi. Unless he, or she, has a very compelling answer in opposition – don’t settle for evasions about ‘gerim’ as converts; we weren’t converts in the land of Egypt! – I urge you to consider getting involved. This is not just a political crisis, it’s a religious one. 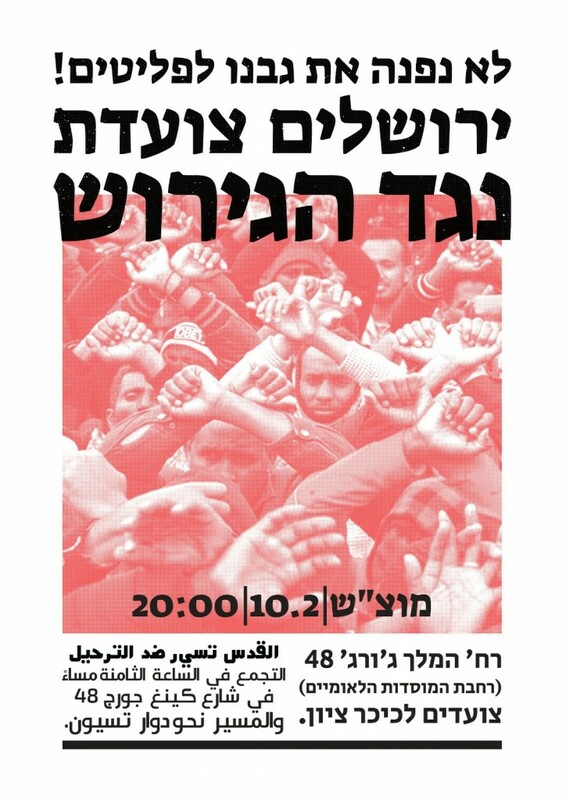 If you are in or near Jerusalem, please consider coming to this protest march at 8pm on Motzai Shabbat (Saturday 10 February), starting at 48 King George Street, outside the JNF building, near the corner of Shmuel Ha’Nagid. 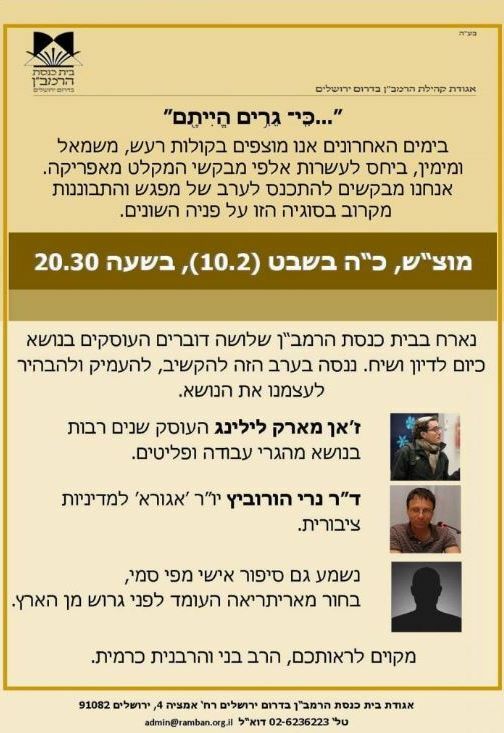 Alternatively, if protest marches are not for you, you could attend a protest meeting, at 8.30pm Motzai Shabbat February 10th, at Jerusalem’s Ramban Synagogue with Rav Benny Lau and speakers including Jean-Marc Lilling of the Center for International Migration and Integration. For an up-to-date summary of the political issues, read this. Before coming to Israel in 2011, Diana Lipton was a Fellow of Newnham College, Cambridge (1997-2006), and a Reader in Hebrew Bible and Jewish Studies at King's College London (2007-2011). Here in Israel, she's lectured on Bible at Hebrew University's Rothberg International School and, currently, in the Bible Department at Tel Aviv University. She's the very proud mother of Jacob and Jonah, and lives in Jerusalem with her husband Chaim. Her latest book, 'From Forbidden Fruit to Milk and Honey: A Commentary on Food in the Torah' (Urim Publications) is available on Amazon; proceeds go to Leket, Israel's national food bank.